ARLINGTON, Va., May 11, 2018 /PRNewswire-USNewswire/ -- In honor of Military Spouse Appreciation Day, the USO is launching a six-month salute to military spouses. 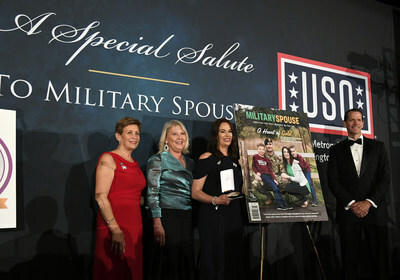 The Salute to Military Spouses campaign aims to raise public awareness of the challenges and contributions of our nation's unsung heroes by giving the public, influencers and military stakeholders concrete ways to lend their support and voice to issues that matter to the military spouse community. 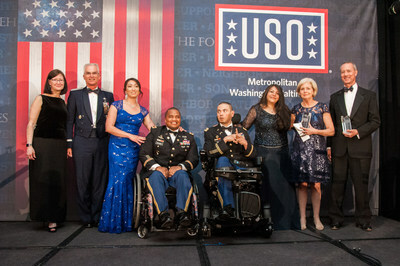 The Salute to Military Spouses campaign kicked off Thursday night at USO of Metropolitan Washington-Baltimore’s 36th Annual Awards Dinner, emceed by Elaine Rogers, president and CEO of USO-Metro, and football legend Terry Bradshaw at the Omni Shoreham Hotel in Washington, D.C.
(Left to right): Mrs. Ricki Selva and her husband General Paul Selva, Vice-Chairman of the Joint Chiefs of Staff; service members and their spouses; Mrs. Sally Thornberry, recipient of the USO-Metro’s 2018 Patriot Award and wife of Congressman Mac Thornberry, Chairman of the House Armed Services Committee. Mrs. Ellen Dunford, wife of Marine Gen. Joseph Dunford, Chairman of the Joint Chiefs of Staff, named Army spouse Krista Simpson Anderson as the Armed Forces Insurance 2018 Military Spouse of the Year®. Kellie Pickler shares her salute to military spouses. "This national salute celebrates the powerful role military spouses play in ensuring the readiness and morale of our nation's military," USO CEO and President J.D. Crouch II said. "Being married to a service member is more than marital status; it's a way of life that requires selfless sacrifice. Our six-month spotlight will honor that commitment while rallying the public to support the needs of the often-unheralded military spouse." 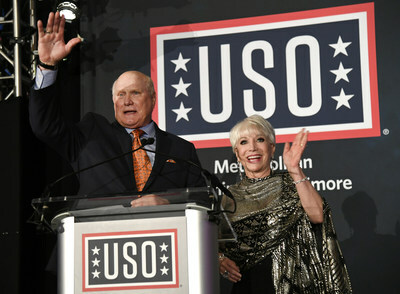 The Salute campaign kicked off Thursday night at USO of Metropolitan Washington-Baltimore's 36th Annual Awards Dinner, emceed by Elaine Rogers, president and CEO of USO-Metro, and football legend Terry Bradshaw at the Omni Shoreham Hotel in Washington, D.C. It was a star-studded evening that served as a first step in the USO's six-month effort to shine a spotlight on the military spouse. Ellen Dunford – wife of Marine Gen. Joseph Dunford, Chairman of the Joint Chiefs of Staff – named Army spouse Krista Simpson Anderson as the Armed Forces Insurance 2018 Military Spouse of the Year® before a crowd of more than 100 military spouses and 800 attendees to include the Joint Chiefs of Staff and their spouses, Congressman Mac Thornberry and his wife, USO-Metro volunteer Mrs. Sally Thornberry, Miss America Cara Mund, Celebrity Chef Robert Irvine, Retired Army Captain and Medal of Honor recipient Florent Groberg, service secretaries, USO corporate partners, members of Congress, business and community leaders. "Overcome your fear of failure, find your faith in community and don't be afraid of the hard; always lead by example and let your testimony be the light for others," she said. Kellie Pickler, an 11-time USO tour veteran, performed "God Bless America" with the American Military Spouses Choir and shared her own personal commitment to the USO's effort. "It was an honor to perform with the very talented American Military Spouses Choir and be a part of a special night that shines a light on the service and sacrifice of our military spouses," Pickler said. In the months to come, the USO will continue to educate America about USO resources available to support military spouses and invite the public and influential voices to join the campaign by sharing military spouse stories and saluting them on social media with #MilSpouseSalute. Messages of support can also be shared through the USO's Campaign to Connect. In addition, the USO will utilize its global footprint to interview and solicit feedback from spouses across the nation. This research will be shared at the campaign's finale, The Salute to Military Spouses , a half-day summit in November with media partner POLITICO in Washington, D.C. The live-streamed summit will bring military spouses, military support organizations, business leaders and key USO supporters together for panels that examine key issues such as education and employment, community building, peer networking and family-strengthening programs, among others. The event aims to make a collective impact by driving dialogue and action in support of the most prevalent needs of military spouses, today and into the future. "No other military organization has the reach of the USO, and we feel it's our responsibility to bring these important issues to light through this timely campaign," said Senior Vice President of Operations and Programs, Alan Reyes. "Together, we can make a big impact in support of America's military spouses who truly are the Force Behind the Forces."